The Scrum Alliance and Forbes Insights recently released a report called the “The Elusive Agile Enterprise”. The report presents the findings of a survey that involved over 1,000 C-level executives across the globe in a range of industries. In this interview, Scrum Alliance Vice President of Global Marketing and Communications, Renata Lerch and I talk through the results of this survey and what they mean for organizations adopting Agile. 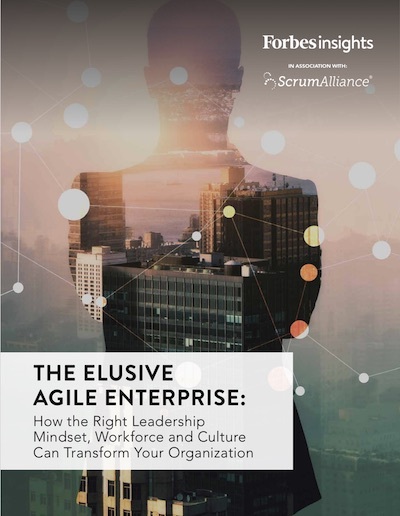 We also explore some of the more valuable insights that came out of the report including the 3 elements determined to be critical to a successful adoption of Agile and how the findings have helped the Scrum Alliance make a decision to target Human Resources as an area of growth in the future.